Twitter is rolling out its “Lite” version, after a successful trial in the Philippines. The Android app will become available in two dozen countries across Africa, Asia, Europe, the Middle East and Latin America. Not too different from Facebook Lite, Twitter has also built a version of its app that’s optimized for developing countries. Twitter Lite minimizes data usage, which makes it more accessible in regions where data plans are too expensive. The app is able to load faster on a slow connection. Twitter says it is “more resilient on unreliable mobile networks,” like 2G and 3G. Twitter additionally reduced the size of the app to under 3MB, so that it doesn’t take up too much space on a phone. 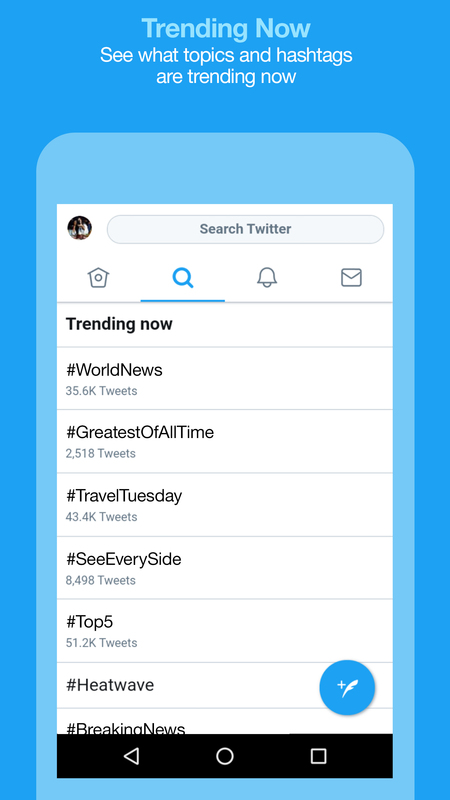 The full list of countries where Twitter Lite is being made available is Algeria, Bangladesh, Bolivia, Brazil, Chile, Colombia, Costa Rica, Ecuador, Egypt, Israel, Kazakhstan, Mexico, Malaysia, Nigeria, Nepal, Panama, Peru, Serbia, El Salvador, South Africa, Thailand, Tunisia, Tanzania and Venezuela. Twitter says its Lite experiment has led to a greater than 50% increase in tweets. The move should help Twitter expand its presence internationally. The company has 330 million monthly active users, 80% of whom are outside the U.S.
Twitter investors closely watch the company’s user growth. After a volatile few years on the stock market, Twitter’s stock has mostly remained constant for the past year. But at $20.58, it’s still less than a third of the high of $69 it achieved in early 2014.